New powers to tackle fly-grazing in England came into force this week, but the head of a leading equine charity warns that the fight against the troublesome practice has yet to be won. The chief executive of Redwings, Lynn Cuttress, hailed the Control of Horses Act, but raised ongoing concerns around equine passports and microchipping. “Although required by law, the enforcement of compulsory passporting and microchipping of horses is lacking, as is a centralised database for storing and retrieving horse and owner information in order to bring fly-grazing perpetrators to account,” Cuttress said. The Control of Horses Act came into force on Tuesday across England. It gives local authorities more powers to rein in owners who graze their horses on land without permission. The private member’s bill, introduced by MP for York Outer Julian Sturdy, is considered a positive step forward in the fight against fly-grazing by the coalition of animal welfare charities and rural organisations that lobbied for the bill. These included Redwings, World Horse Welfare, Blue Cross, the British Horse Society, the CLA, Countryside Alliance, HorseWorld, the Local Government Association, NFU, and the RSPCA. The new legislation is similar to that which came into effect in Wales in January 2014. The latest act gives greater powers to English authorities to seize illegally grazed horses. It also provides greater reassurance for landowners who find themselves a victim of fly-grazing by significantly reducing the lengthy and expensive process of removing the horses from their land. Under the new legislation, the authorities will be able to take action after four days rather than a minimum of two weeks as it was previously. Equine charities say fly-grazing poses a real risk to both horse welfare and the public. More often than not, horses are left to fend for themselves on private or public land without sufficient shelter, water or food, and subsequently fall victim to serious illnesses. The horses are often grazed on land without a suitably fenced perimeter, leading to tragic incidents of animals escaping on to busy roads and motorways. The passing of the Control of Horses Bill for England is therefore seen as a significant move in improving horse welfare, protecting landowners, reducing risk to public health and deterring irresponsible owners. 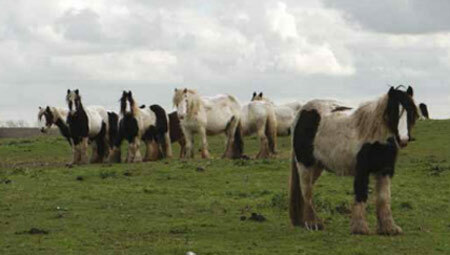 About 3000 horses are estimated to be fly-grazing across England at present. World Horse Welfare’s chief executive Roly Owers described the new law as an important step in improving horse welfare. It allowed more effective action to help fly-grazed horses, whilst putting landowners and local authorities in a much stronger position, he said.